Once the winter season is nearing its end, the days become longer, the sun feels warmer, and the earth wakes up and shows signs of new life, we also feel refreshed and ready to celebrate spring. Some of the more popular spring celebrations in the United States include the visit by the Easter Bunny, Easter Egg Decorating, and Easter Egg Hunt. My parents were my first mentors, and story tellers, about this old tradition, which was very popular in their native countries, Ukraine and Poland, and it continues to thrive in the Diaspora. Egg decorating tradition dates back to pagan times, well over 2000 years before the time of Christ. People believed that great power was embodied in the egg, so they decorated eggs in the spring to celebrate the warmth of the sun which in turn brought back the joy and vigor to life, after the cold winter months. Decorated eggs were used by well wishers for good luck, prosperity, and even fertility. Single girls would make sure to have a nice collections of freshly decorated Easter Eggs to present to every young man who would visit their home during Easter time. Also, on Easter Monday (still being an Easter Holiday in Ukraine and Poland) if girls ran out or Easter Eggs to give away as gifts, their male friends would bring them outside, and drench them with buckets of water. This custom has died out somewhat, but children, especially boys, still have fun spraying the girls with water held in specially designed color plastic eggs with a sprayer top. There also was an old legend that if you are lucky enough to preserve an Easter Egg for 100 years, the insides will dry out and turn into a diamond. The 80 year old Easter Eggs I have in my collections, will definitely not prove this legend right or wrong, since these eggs are hollowed out, actually to my advantage (believe me, you don’t want one of these old whole eggs crack open on you….). With the introduction of Christianity, the ancient customs were absorbed into the Christian celebration of Christ’s Resurrection. The new meanings expressed in the design, blended harmoniously with the old, so today the decorated eggs display a mixture of the pagan and the Christian symbolism in their design. Ukrainian Easter Egg decorating is very intricate, since it requires the use of hot liquefied beeswax, flowing through a stylus, kistka, a metal funnel like vessel attached to a wooden, pencil like, handle, with which the artist is outlining a design on the shell of a raw white egg. The color usage sequence is extremely important in Ukrainian Easter Egg decorating, to capture the most vibrant colors in the design of the final product, so it requires very thoughtful planning of the design as the first step, before starting to decorate the egg. 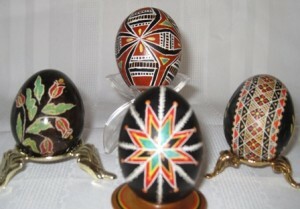 There are four basic colors used in Ukrainian Easter Egg decorating: yellow, orange, red, and black. Of course, there are numerous other colors incorporated in small amounts into the design, and some styles require other major colors, but the main four colors are almost always found in all designs. What makes the Ukrainian Easter Eggs different from other designs, is the geometric pattern used in majority of the designs. Now that I have introduced you to the egg decorating tradition, and a brief description of the Ukrainian Easter Egg decorating style, my next post will describe this process step by step, so stay tuned until then. You’ve got me hooked and I will definitely be anxiously waiting for the continuation! I truly appreciate the glimpses of culture that you share with us. Keep it coming! What a beautiful story of this great tradition. I think I shall paint flowers for love this Easter 🙂 Thanks for stopping by my allwomenstalk post!! I always love hearing from you! Have fun painting your flowers……You must be so busy keeping up with two sites. Great job on both!! This recipe is from the cook book of Savella Stechishin, I made few modification…I think she has a typo on amount of flour…My family loves this paska, so it became our family favorite. I found your site by accident, looking for a place to, have my basket blessed, which I have done no preparations for as yet! I hope my father is sitting on one shoulder and my mother on the other, to help me through this! I look forward to reading other posts, mentioned, by other readers! Happy Easter to all, loralee (not a typo) Kubica, originally from Bucktown, near Milwaukee Ave, moved further North & West next to Milwaukee Ave! Now in Elgin, IL hope I’m able to make something fory basket! My only reply is that at the end, I wrote, hope I’m able to make something fory basket. Should of read, something for my basket! Just read this long decussion, about what, “Your comment is awaiting moderation.” I just tead, what it meant on a different site! Got confusing after awhile, the jest of what I could grasp, is the site owner, has chosen, to read comments, before they post! Which is the option of the site owner! If I got this wrong, I’m sorry, like I mentioned it got very confusing after a while! Doesn’t matter to me, I thought it was a nice comment, maybe, you will to! Again, Happy Easter, to everyone! P.S. This is all new to me & I appreciate your time and effort, for the information, for us to use for Easter, & your other recepies! I am so happy to hear that you found my blog and liked my posts. I am sure you will be able to locate a Ukrainian Church nearby where you can bless your basket. I applaud you for trying to keep up with the Ukrainian tradition. Your first comment was fine….I knew what you meant and I could have corrected it for you…no biggie. Thank you again for stopping by and taking the time to leave such a nice comment.